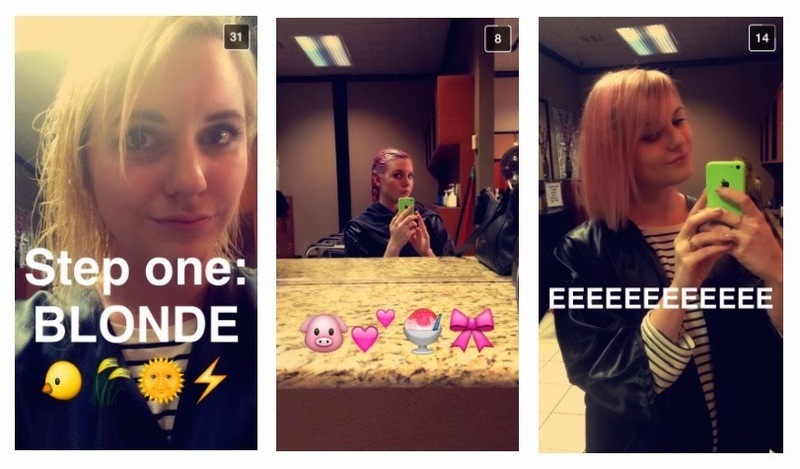 A few weeks ago, I hair chalked my way to a hot head of pink hair. When it faded to a hue much more suitable to my life, I discovered a part of me I thought could be quelled by temporary measures - a part that loved having wildly colored hair full-time. 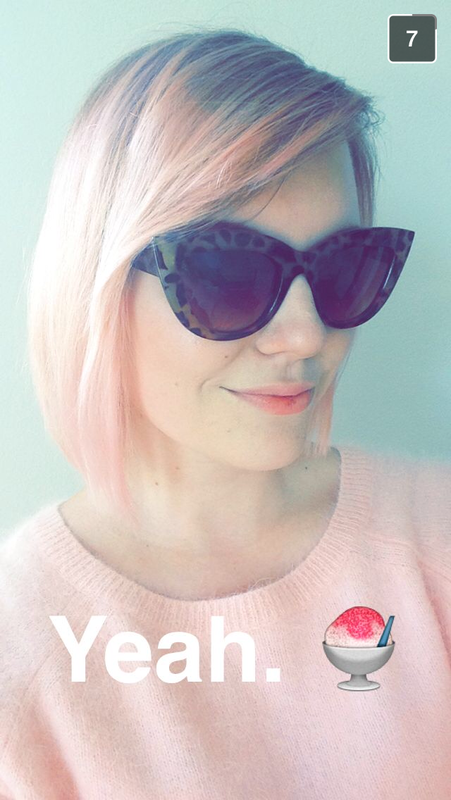 After the last hints of pink left my dirty blonde mop, I soon found that I missed the pink too much to go without it! So last Saturday I took a visit to the lovely Jen and went permanently PINK. Well, as permanent as one can go. First step was to lighten my roots to match the rest of my blonde, after which she applied the pink dye all over my head. 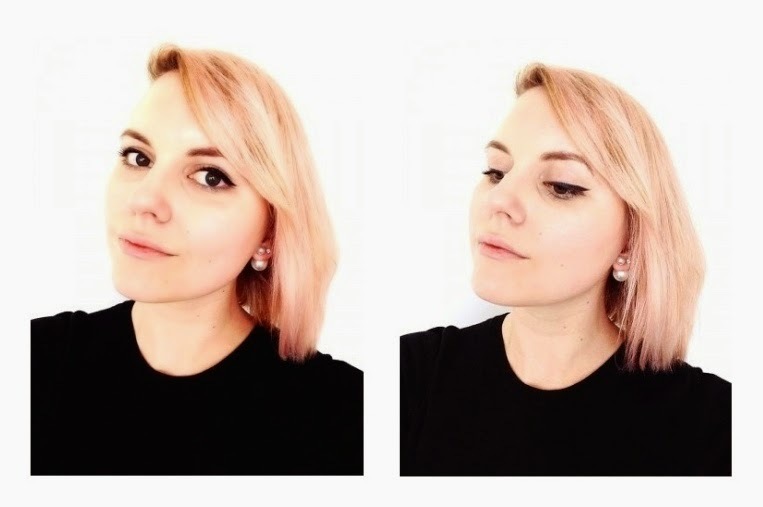 Pink is one of the best shades for hair, because it doesn't do anything weird while it's fading out - green and blue can leave you looking like a victim of too much chlorine, I know from experience - but the only thing pink does is fade to a lighter pink! Occasionally you may find a slight orange tint, but fashion people call that "rose gold" when it happens to Sienna Miller so I think it's acceptable for normals as well. My only issue with pink dye so far? It washes out fairly quickly - I was warned it may take as few as three or four shampoo sessions to deplete my hair of all pink pigments. I've got a few tricks up my sleeve, but I'll be keeping close tabs on it. Gorgeous color. I adore it. Exactly the light, airy pink I was looking for. It's got dimension and body, and looks pretty nice on my pale-girl skin. And it goes great with my Lana Del Rey for H&M sweater I bought ages ago! I knew it'd come in handy...someday. After my first wash, my hair was pretty faded - still pink, but definitely in Sienna territory (I flatter myself). More pink than these photos would have you believe! If I hadn't had an event to work that evening I probably would have just used dry shampoo, but I didn't think the good people of downtown LA would appreciate being told that not only were they not on the list, but by an unclean ragamuffin to boot. For future washes, I'll be using the Overtone pastel pink conditioner to keep my pink going as long as I can - it hasn't arrived yet, so updates to come when it does! Overtone makes incredible hair products for any shade you can think of - each color comes in pastel, vibrant, and extreme shades. Obviously I went with the pastel, but anyone can use these to add a tint to their current color (if you're within the platinum to light brown spectrum). They even show swatches to give you an idea of what it will look like! Of course, use at your own risk, and don't come crying to me when you've home-bleached the you-know-what out of your hair and the "extreme blue" deep conditioner turned you into Tobias Fünke. Stay tuned for more adventures en rose!